#1 - Hand quilt Vintage quilt - A commission to finish hand quilting this vintage hexie quilt, which has been started and worked on by three generations of women. Not a project to rush at all but I would like to think I can work away at it a little at a time and get it finished. #2 - Secret quilt - Pattern testing and so far very pleased with my points! #3 - Buggy liner - I had originally bought this Rocket Age fabric simply because I loved it and thought I could use Fred as an excuse to make something with it but my friend spied it and wanted me to make her a buggy liner for the warmer months and so I'm using a couple of these to do just that. #4 - Two pillowcase dresses - a commission and I'm excited to use my lovely Tula! #5 - Two more pillowcase dresses - these ones are for my girls using pretty Essentials by Pat Bravo prints. #6 - Skirt - I got this bargain fabric from Minerva Crafts and am going to attempt to make myself a skirt! 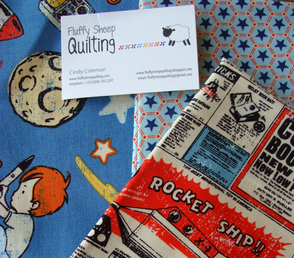 They have lots of clearance sale fabrics, great for dressmaking and most under £3 a metre. #7 and #8 - Two secret projects - the first is the orange project, it's a secret and it's orangey; the second is also a secret and uses some mini charms. #9 - Scottie Dogs - using more mini charms. #10 - One for me!!! 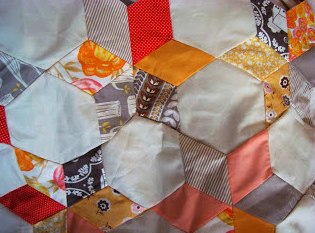 - I'm making myself a project from the book Quilting on the Go using yummy Cotton and Steel! #11 - A small make - for this month's theme at Le Challenge. 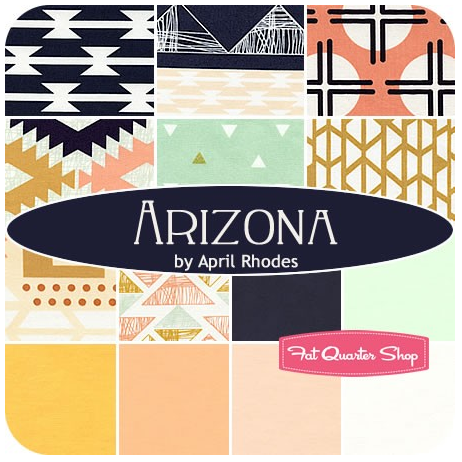 #12 - Japanese x and + Quilt - using Arizona by April Rhodes because I love it! #11 - Liberty hexies - they are so tiny what was I thinking?! I don't have time to such little fiddly things! Get turned into something already... though they are so pretty! #13 - Embroidered poem - so so close to finishing but didn't want to rush just to link up last quarter. #14 - Butterfly Quilt - Saving my last bit of wadding to get this basted since it's for my daughter and I want it done so she can stop asking me about it... though I will be hand quilting it. #15 - Star flower quilt - whatever... ran out of wadding... more excuses... languishing. Loopy Lu you now have more projects than me! I think you actually have 17 there, not 15. Awesome projects! Every single one of those projects is simply gorgeous. I can't wait to see how many you finish before October! What a great list, and I think you will just have to get a bunch more wadding. You are right, totally nuts! Good luck. #10, #10!! but I'm biased. My goodness, you have sooo many hand work projects on this list, I'd need to give up sleep (or get a permanent coffee IV) to get them all done. Be good to your fingers, shoulders, and eyes! I'm cheering you on, but don't want you to get burnt out! That is quite a list, and I look forward to watching you work through it! :) And yay for secret projects. And orange! Oh I'm pretty sure you're nuts, but it's nothing to do with the list ;o) Good luck! You win the prize for the longest list! Wouldn't it be awesome if you got them all finished! so, so many lovely projects! and i was wondering about your little liberty hexies! they are so sweet - yes, get made into something already! good luck, friend, with all you've got on your hands. what do they say about girls that wear glasses? Start choosing - Fat Quarter Shop GIVEAWAY!